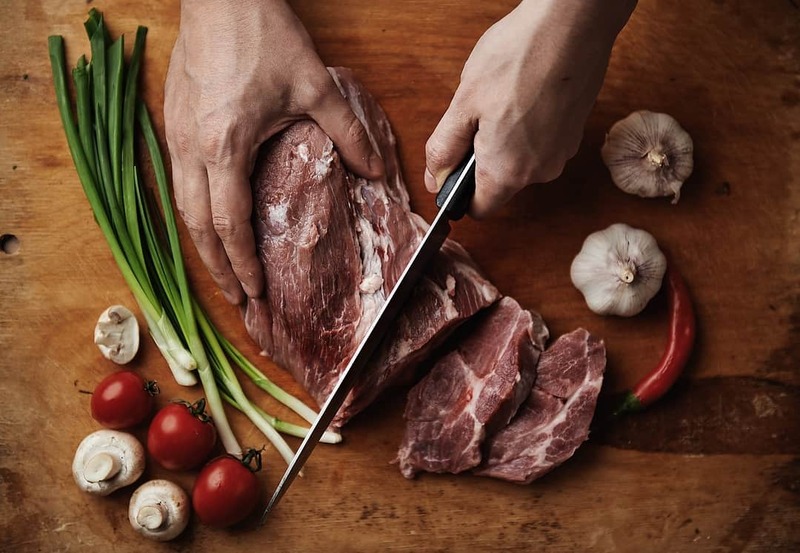 The butcher knife is one of the most important knives you can have in your kitchen, especially if you like to cook up a good steak on the grill every now and then. 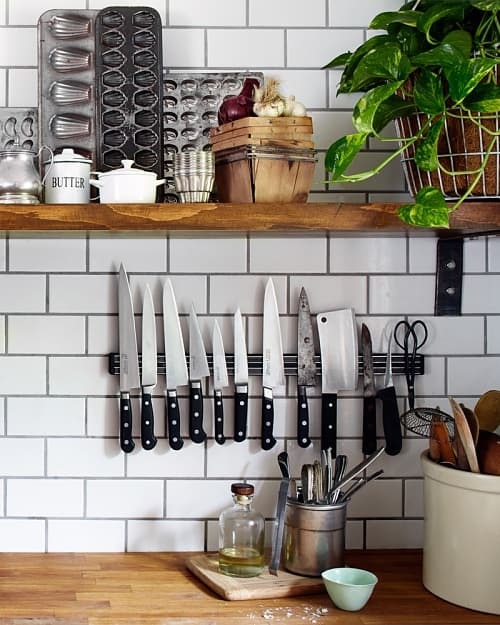 Don't confuse the almighty butcher knife with the multi-purpose chef's knife. Generally speaking, the butcher knife is going to be heavier than a chef's knife because it's made to cut through thick slices of meat. If you'd like a visual overview of butcher knives, check out this chef who gives a complete overview of the different types of knives. There is more than one kind of butcher knife available to a chef. Knowing what kind of butcher knife you need is the first step in the selection process. 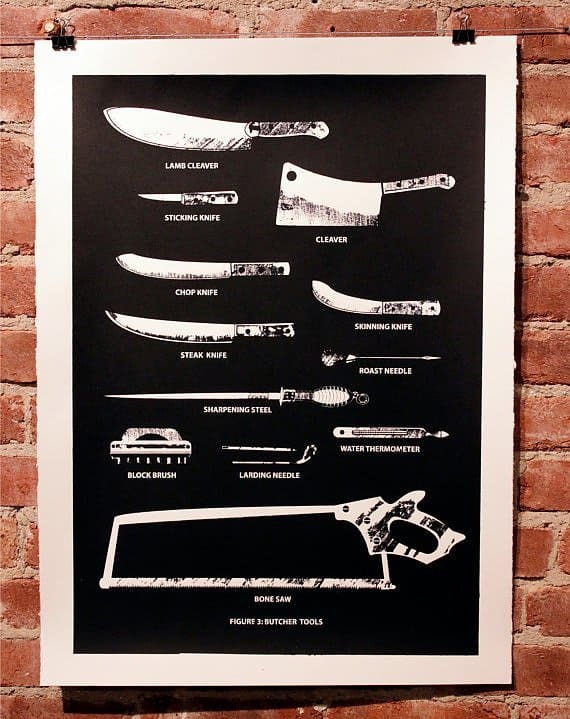 If you're only getting one butcher knife, you'll want to go with either a classic or scimitar-shaped knife. The classic knife has been in use for over 200 years, and it will provide you with a clean cut that is capable of slicing through bone with ease. This blade originated in England, and it has a curved edge to make it easier to skin an animal and cut through bone. The scimitar is capable of doing a bit more because it has an improved blade with a curved tip. The scimitar is capable of cutting down steaks, removing parts and cutting into animals. Smaller butcher knives are designed for specialty applications, like deboning, filleting and other fine-tuning applications. Most chefs just need one high-quality butch﻿﻿er knife. Don't buy a set; it will often come with additional knives that you'll never use. When getting a butcher knife, you want to concentrate on the butcher knife itself and not get distracted by the other knives that may come in the set. It's better to invest money in the best quality knife you can afford rather than get an inferior quality knife that you're simply going to replace. Cheap knives often break under heavy use. A butcher knife must be strong to be able to cut through bone and meat. There are several criteria you should be on the lookout for when selecting the best butcher knives for your kitchen. The best material for a butcher knife is typically carbon steel. This gives you a sharper edge, and you'll be able to cut through meat more effectively. When it comes time to hack away at cartilage, the carbon steel will stand up to even the toughest situations. You'll also want to look for a butcher knife that is forged and not stamped. When you buy a stamped knife, you're getting a knife that has been pressed together with several layers to get the thickness. A forged knife is a solid piece of metal that will be sturdier and heavier. Sharpness is also a factor, and the knife must be sharp. If you find that you're constantly sharpening the knife, it's going to cut into your preparation time. Additionally, the tip should be slightly curved so that you can cut into meat more easily and separate flesh from bone. Most butcher knives look like scim﻿itars. This design gives you a distinct advantage over the classic butcher knife. The curved form of the knife makes it possible to cut through the flesh and complete a bit of fine-tuning work. The curved design also tends to result in a better balance, and it will feel better in your hand. Keep your knife in top condition using proper maintenance procedures. Make sure you're keeping your knife in a sheath and don't just throw it in the utensil drawer when you're finished using the knife. Avoid putting any high-quality knife in the dishwasher. The detergent in the washer will corrode the steel on your knife. If you're cutting smaller portions, don't use the blade to slide the cuts out of your way. Make sure you turn the blade around and use the flat spine to clear your cutting board. This will preserve the integrity of your blade. Find out how a butcher sharpens knives to keep them in top condition. The technology of your knife really matters, and the Dalstrong Boning Knife gives you exceptional cutting power. The knife has a handle that's impervious to moisture, cold and heat. It uses military-grade materials, and it's designed to make short work of any animal. The knife is perfectly balanced, which will help you get more power with each cut. Designed to work in several applications, it will have you completing a variety of procedures, including de-boning, preparing, skinning, filleting, trimming and cutting your meats with a butterfly technique. You'll love how easily this product cuts through meat, and it also offer exquisite engraving to make it look as good as it functions. A nitrogen-cooled manufacturing process gives it a high hardness level to make short work of all your butchering needs. The knife won't rust or corrode, and it features a hand-polished spine for an exceptional appearance. A bigger-sized knife would be helpful when you need to cut through bones. Learn more. The knife features a 62+ Rockwell hardness score for durability. It's constructed with a VG-10 Japanese Steel Core and triple rivets, also for durability. Versatile Rockhollow divots reduce food sticking to the blade. The Victorinox 10-Inch Curved Breaking Knife is an exceptional knife in the mid-range pricing category. This is the knife that most serious home chefs will want to own. It's not too expensive, and it offers all the features you'd expect in a good butcher knife. You'll be able to break down large quarters into smaller parts and roasts, and it comes with a curved blade to make it easy to get a single pass cut for removing bones from the flesh. The knife is made from premium materials, and you'll enjoy the conical ground design that makes it easier to use in breaking. The knife is also beautiful to look at as it comes with a rosewood handle and exceptional styling. Made by expert craftsman in Switzerland, this is a quality blade that will last you a lifetime. Carbon stainless steel blade provides exceptional hardness. The blade has a bolstered edge to make it easy to use the entire blade. It is designed for single pass cuts and for separating bone from flesh. The Mad Cow Boning Knife is a knife that is capable of getting a lot done with minimal effort. You will love the stiff blade and the high-quality construction that will make this blade last a lifetime. The blade has been hand sharpened for the best utility, so it's ready to work right out of the package. The molded lines offer substantial comfort, and you'll be afforded a solid grip when using this knife. The material is made from non-toxic materials, and the handle is also heat resistant for use in a variety of applications. 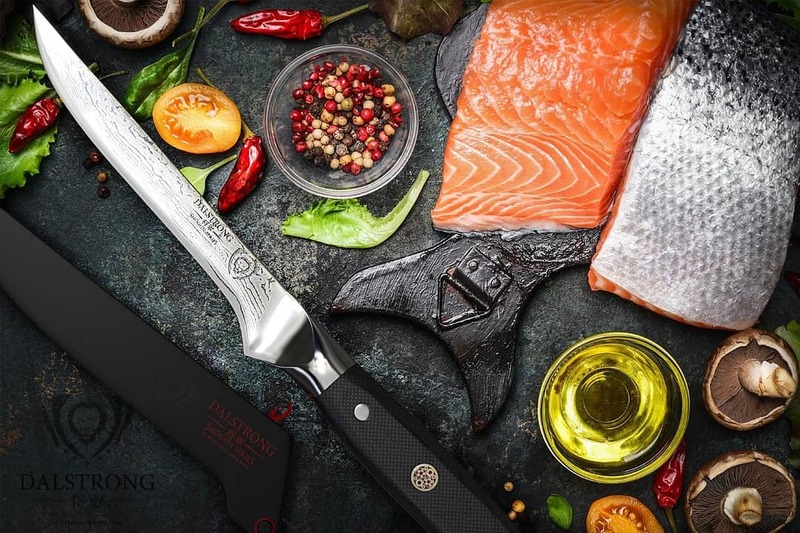 This device is engineered to help you get the most out of your butchering sessions, and you'll be able to enjoy a dependable, high-quality knife. The knife is made from non-slip materials, so you won't have any issue holding on to this knife. The tip of the blade could be more pointed for cutting finer portions. Regular sharpening of the blade is required for the best performance. This knife will likely find a permanent place in your kitchen. It's designed to offer superior performance, and it feels good in your hands as you're cutting and breaking. The blade is designed for quick de-boning, and you'll be able to remove the bones without puncturing fish. With an exceptional non-slip pattern, you'll also be able to use this device in a variety of situations while avoiding water damage. The blade stays sharp due to its high-quality materials, and you'll spend less time maintaining this knife. The knife is perfect for the individual who doesn't want to spend a lot of money. You'll love the efficiency and how easy it is to use, clean and care for. The blade is Titanium bonded, and it uses a 4116 German stainless steel blade. The blade is corrosion resistant and stays sharp longer due to the titanium construction. A non-slip grip is achieved through the use of a Cuda scale pattern. The blade uses a full tang construction. The blade is best used for de-boning fish and may not provide the weight to cut into heavier meats. The design is made for precision cuts, and it isn't ideal for breaking. The Sani-Safe Butcher Knife is built to be both sanitary and robust. 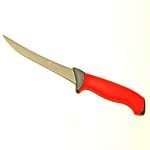 The knife features a slip-resistant handle, and it is capable of handling both high and low temperatures. When you want a knife that is capable of helping you cut through a wide variety of meats, this knife is an exceptional buy. This is an inexpensive knife for the chef who doesn't need to cut up entire animals. You'll love the functional finger guard that helps to protect you from harm, and it's the perfect knife for a beginner. The knife is designed to last, and you'll likely have it in your kitchen for the next two decades if you take good care of it. You'll enjoy the strong, rigid blade and the nonslip handle that's designed to help you get into cuts more effectively. To keep your butcher knife sharp, you can check out the best electric knife sharpener here. The carbon-steel blade provides exceptional hardness. The pointed tip makes fine-tuning easier. A straight edge makes it easy to cut into bone in a variety of applications. The size of 6 inches isn't long enough for all applications. The blade needs continual sharpening. This knife is made with a plastic handle, which is not as sturdy as other knives. While all of the knives featured have their pros and cons, the clear winner of this review is the Victorinox 10-Inch Curved Breaking Knife . The Dalstrong is an exceptional knife, but when you consider the cost in relation to the added features, the Victorinox is superior. It's a versatile knife, and because you only need one butcher knife, going with the Victorinox makes the most sense. The knife is sharp, is easy to care for and makes cutting into bone a breeze.I especially love the bolstered blade, which will let you use the entire length of the blade in your cutting applications. It's heavy enough to be used for breaking while still maintaining a light enough structure for fillet and fine-tuning procedures. The carbon stainless steel blade will last a lifetime, and you'll love the exceptional durability and strength that this knife exudes. Tell me what you think about this article. Make sure to leave your comments below and share this article if it was helpful.